The most commonly ordered spine radiographs, x-rays of the cervical spine are used to evaluate trauma and everyday neck pain. X-rays are also useful for evaluation of the postoperative patient. The three essential views are AP, Lateral, and Odontoid. 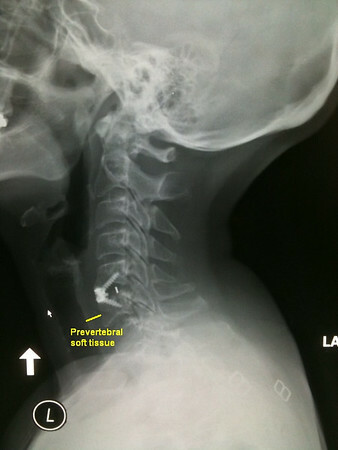 The AP view of the cervical spine is shown here without comment. It is the least revealing of the C-spine views. Ahhhh, the workhorse of the cervical x-rays. Look here for vertebral fracture, subluxation, jumped facets, and prevertebral swelling. Start by evaluating the vertebral bodies. Numbering starts with C2, characteristic with its unique shape, with the “peg” of the dens rising high from the body, penetrating the ring of C1. The disc immediately below that is C2-3. Numbering follows from there. The vertebral bodies C3 through C7 appear as “boxes,” and in trauma you will sometimes see an anterior “teardrop” fracture after flexion injury. The posterior vertebral line (posterior marginal line) follows the back edge of the vertebral bodies. As in the lumbar spine, anterior displacement of one vertebra on another is not uncommon, especially of C3 on C4, or of C7 on T1, and this may not be clinically significant. However anterolisthesis of C4 on C5, or C5 on C6, or C6 on C7 can signal a dangerous instability that threatens cord compression. This is often seen in cervical fracture, and in severe cases can be combined with perched or jumped facets. 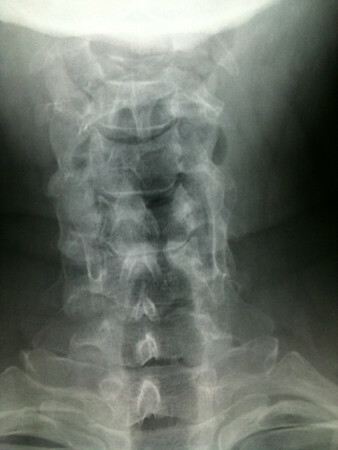 A Hangman’s fracture of the isthmus of C2 may appear as a subluxation of the body of C2. The atlanto-dental interval (ADI) is the space between the dens and the anterior arch of C1. Normally it is tiny, the barest sliver of space. If the C1 ring is fractured, the C1 ring widens, and the space between the dens and the anterior arch of C1 may widen. This widened “atlanto-dental interval” suggests a fracture of C1. The prevertebral soft tissue thickness is normally just a few millimeters at C2-C4, and it markedly increases at the C4-5 level and below. Abnormal swelling of the prevertebral soft tissues is seen with cervical spine trauma, or after routine anterior cervical spine surgeries like the ACDF. Swelling of the prevertebral soft tissues can threaten the airway and is a surgical emergency. Intubation may be needed to protect the airway, and if a postoperative hematoma is suspected, emergency surgical evacuation may be needed. So use the lateral C-spine x-ray to evaluate the posterior vertebral line and the prevertebral soft tissue thickness. The open-mouth odontoid evaluates the C1 and C2 vertebrae. This view is essential in evaluating the trauma patient. The lateral masses of C1 should be in line with the vertebral body of C2. If the ring of C1 is broken, it widens, and the lateral masses of C1 overhang the body of C2. The dens appears as a peg centered between the C1 lateral masses. 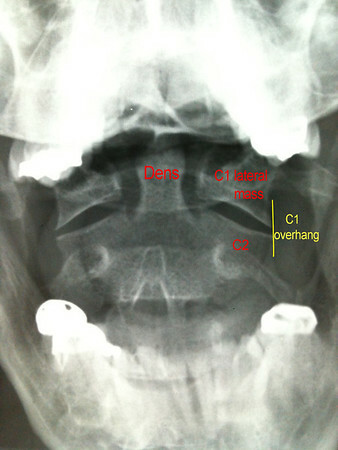 An odontoid fracture may be visible as a crack at the base of the dens, or the dens may appear off center in the frame of C1. So use the open-mouth odontoid view to screen for fracture of C1 and a fracture of the dens.